The following content explains how to use the Gerrit web interface to create and edit changes. Use the web interface to make minor changes to files. 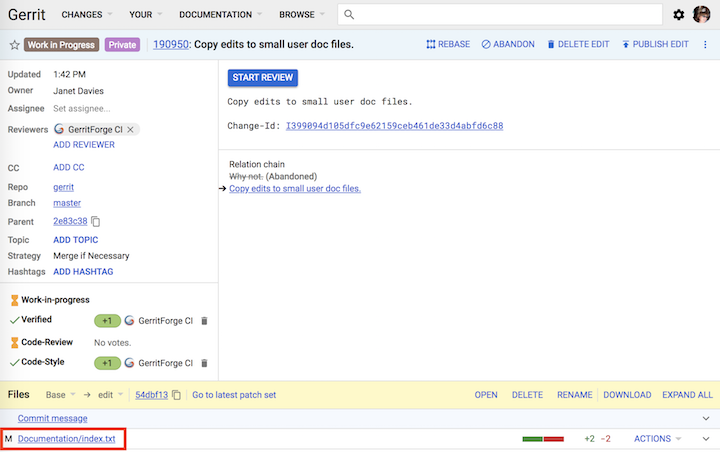 When you create a change in the Gerrit user interface, you don’t clone a Gerrit repository or use the CLI to issue Git commands — you perform your work directly in the Gerrit web interface. To learn more, see the Gerrit User’s Guide. From the Gerrit Code Review dashboard, select Browse > Repositories. Under Repository Commands, click Create Change. Select branch for new change: Specify the destination branch of the change. Provide base commit SHA1 for change: Leave this field blank. Git uses a unique SHA1 value to identify each and every commit (in other words, each Git commit generates a new SHA1 hash). This value differs from a Gerrit Change-Id, which is used by Gerrit to uniquely identify a change. The Gerrit Change-Id remains static throughout the life of a Gerrit change. Description: Briefly describe the change. Be sure to use the Commit Message format. The first line becomes the subject of the change and is included in the Commit Message. Because the message also appears on its own in dashboards and in the results of git log --pretty=oneline output, make the message informative and brief. Private change: Select this option to designate this change as private. Only you (and any reviewers you add) can see your private changes. On the Create Change window, click Create. Gerrit creates a public Work In Progress (WIP) change. Until the change is sent for review, it remains a WIP and appears in your dashboard only. In addition, all email notifications are turned off. Add the files you want to be reviewed. Files can only be added to changes that have not been merged into the code base. In the top left corner of the change, click Edit. Select the file you want to add to the change. To create a new file, enter the name of the new file you want to add to the change and then click Open. On the change page, click the file name. When you add a new file to a change, a blank page is displayed. When you add an existing file to a change, the entire file is displayed. Update the file and then click Save. You must click Save to add the file to the change. To close the text editor and display the change page, click Close. When you’re done editing and adding files, click Stop Editing. Click Publish Edit. When you publish an edit, you promote it to a regular patch set. The special ref that represents the change is deleted when the change is published. Not happy with your edits? Click Delete Edit. 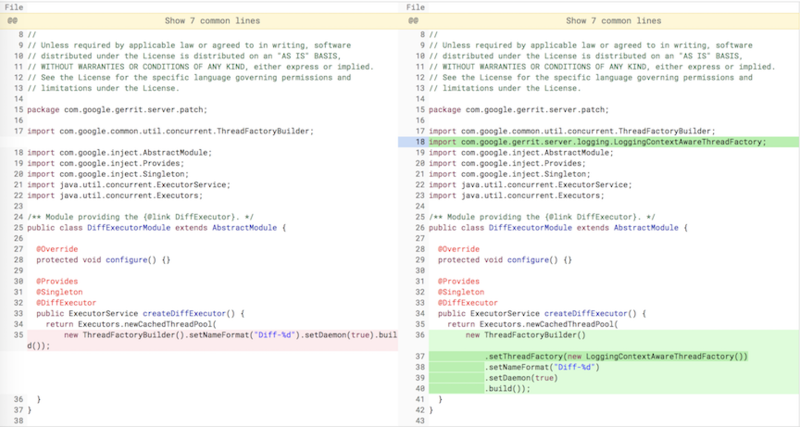 When you start a review, Gerrit removes the WIP designation and submits the change to code review. The change appears in other Gerrit dashboards and reviewers are notified when the change is updated. Add the names of the reviewers and anyone else you want to copy. 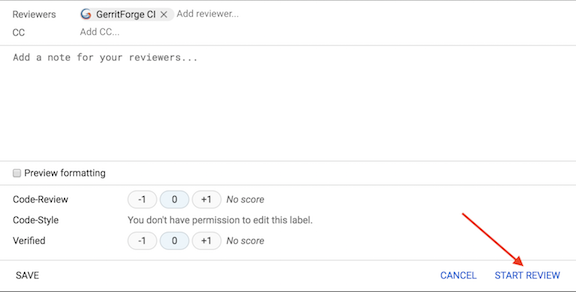 The change is now displayed in other Gerrit dashboards and reviewers are notified that the change is available for code review. Use the side-by-side diff screen. From the Gerrit dashboard, select Your > Changes. All your changes are listed, according to Work in progress, Outgoing reviews, Incoming reviews, CCed on, and Recently closed. For more information about Search operators, see Searching Changes. For example, to find only those changes that contain edits, see has:edit. Only when a change is based on the current patch set can the change be published. In the meantime, if a new patch set has been uploaded, the change must be rebased on top of the current patch set before the change can be published. Open the change and then click Rebase Edit. If the rebase generates conflicts, the conflicts can’t be resolved in the web interface. Instead, the change must be downloaded (see below) and the conflicts resolved in the local environment. As with regular patch sets, you can download changes. For example, as provided by the download-commands plugin. Only the owners of a change and those users granted the accessDatabase global capability can access change refs. Open the change, click the More icon, and then select Download patch. Copy the desired scheme from the Download drop-down. Paste the command into a terminal window.